Divine Favor: the Oracle provides players with new options for getting the most out of the oracle, whose combination of curse and mystery makes it one of the most unique and versatile classes in the Pathfinder Roleplaying Game. 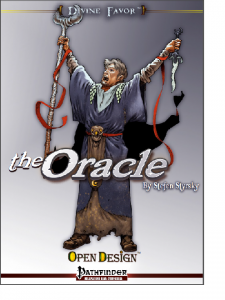 Designed by Stefen Styrsky, Divine Favor: the Oracle doesn’t fool around in its opening section – it gets straight to the curses. Coward is the curse of fearfulness, making the oracle more vulnerable to feat but also more insightful, quicker to act and dodge, and less incapacitated while surprised. Drunkard makes the oracle dependent on alcohol to function but also braver, tougher and less vulnerable to enchantment; and echo is a bizarre curse making it impossible for the oracle to speak anything but the words of others. Other curses include grotesque, illiterate, mute, souless, unstable form and wanderer. The book provides six new mysteries as well. A clockwork oracle can alter the workings of machines and construct items out of thin air. An oracle of the old gods can command aberrant creatures and hear whenever his or her name is spoken aloud – and at higher levels, instantly appear before the one foolish enough to speak your name. An oracle of the moon has abilities that reflect its shifting phases, a plague oracle wields powers of corruption and death, an oracle of snakes has unnerving abilities to grapple, bite, crawl and command serpents, and the oracle of wine combines Bacchic traditions with the tipsy badassery of Jackie Chan’s Drunken Master. Finally, there are new feats for the oracle. Divine Intervention trades the use of a spell for a saving throw bonus, and Forbidden Knowledge allows an oracle to cast a cure or inflict spell even if the spell is not on his or her list of known spells. Empowered Mystery and Mystery’s Alignment provide new advantages to the spells granted by an oracle’s mysteries, and Summon Avatar provides a summoned creature with a mystery-based benefit. 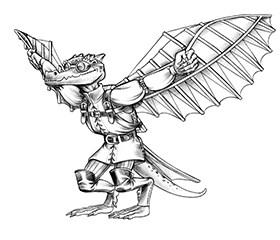 Pick up Divine Favor: the Oracle in the Kobold Store and part the veils of time and space! Also check out the other books in the Divine Favor series covering cleric, druid, paladin, and inquisitor.